Before we get on the plane — less than 24 hours from now — I’m getting in a little practice with this new skill. 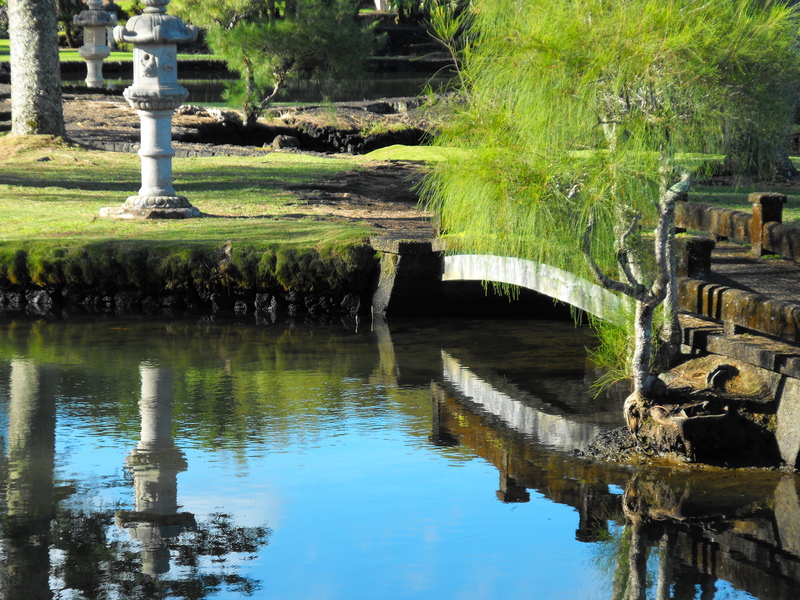 Plus I wanted to let friends know about the public Japanese garden in Hilo. 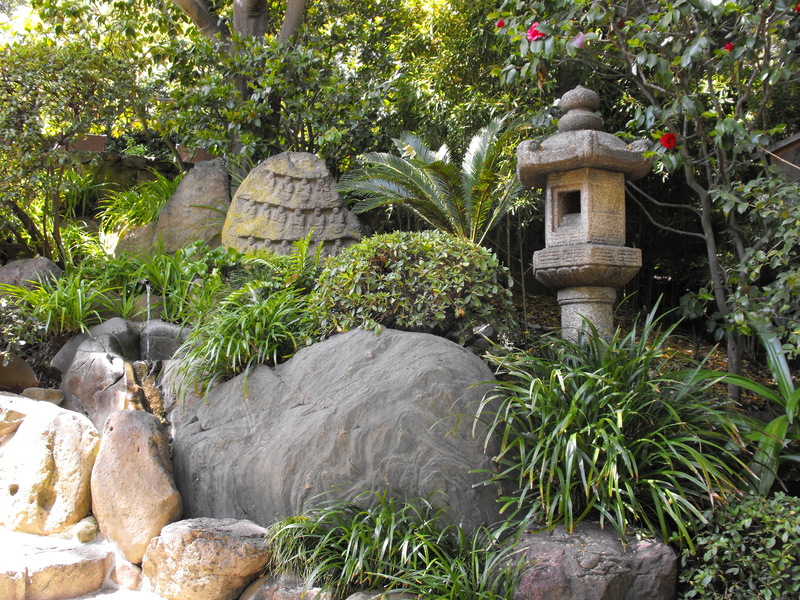 The Isemoto Bridge and one of several stone lanterns donated by prefectures in Japan. This County park is more than 20 acres, including ocean-fed ponds, on the Banyan Drive peninsula overlooking Hilo Bay on the windward side of Hawaii Island. An incorrect 30 acre figure appears in many stories. Even when nearby park lands added to the County’s care by various Governor’s executive orders are totaled with Lili`uokalani Gardens [such as Mokuola (Coconut Island), Rakuen (Happiness Park) and Isles] the total comes to 24.6+ acres. Mainly a stroll garden with a tea house, and several different kinds of paths, Lili`uokalani Gardens are free and open to the public all year long. Land was set aside in the spring of 1917 and initial construction began in November 1917. The gardens were inundated by tsunami in 1918 and 1923. Great damage was done by the April 1, 1946 tidal wave and the gardens were rebuilt in 1949. They were destroyed again by the May 23, 1960 tsunami and rebuilt. In 1968, to commemorate the 100th anniversary of the Gannen-mono (first Japanese immigrants to arrive as sugar plantation laborers), 13 stone lanterns and two stone lion gates were donated by the governors of prefectures in Japan from which the immigrants came, adding to lanterns from the original garden that survived the major tsunamis. In 1972 Urasenke Tea Ceremony Foundation of Kyoto donated a Japanese tea ceremony house, which was placed toward the center. It was destroyed by arson in 1994. A new tea house was built in 1997. One of Nakamura’s California gardens presently is threatened with sale by UCLA Regents. A California court issued an injunction delaying the sale of the Hannah Carter Japanese Garden in Bel Air. The Hannah Carter Japanese Garden in Bel Air bears the name of the donor of the garden to UCLA. This view is through the main gate, across the first flat stone bridge and up the walkway. Kazuo Nakamura also designed and constructed the Bicentennial rock garden at Lili`uokalani Gardens and the nearby Rakuen (Happiness Gardens) behind the Suisan Fish Market. Lili`uokalani Gardens’ massive 1999-2000 renovation project with ADA accessible perimeter walkway was designed by Hilo landscape architect Leonard Bisel and construction by Isemoto Contracting Company Ltd. Four Torii gates were erected at the cardinal compass points. In 2011, Dennis Makishima stopped in Hilo to offer an aesthetic pruning workshop to County park maintenance personnel and UH Master Gardeners. A morning classroom lecture was followed by hands-on practice in the park.